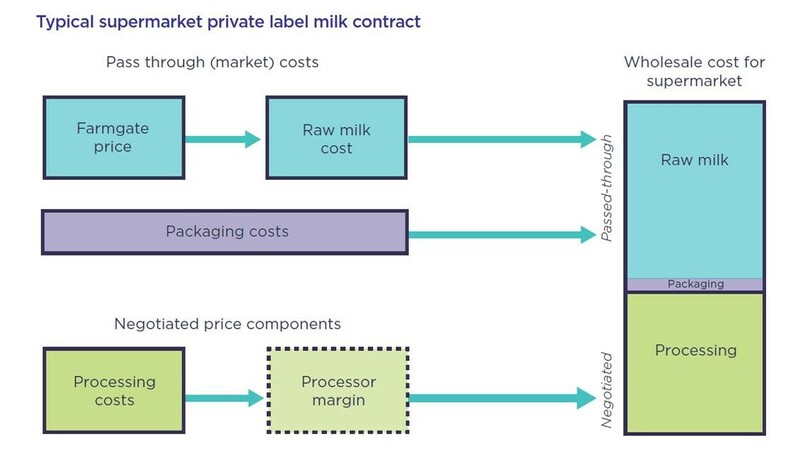 A key finding of the ACCC’s Dairy Inquiry was that almost all contracts for the supply of private label milk allow processors to pass-through movements in farm gate prices to supermarkets. In addition, farmers are paid the same price irrespective of whether their milk goes into private label or branded products. These findings were based on detailed evidence provided by supermarkets and processors. The milk supply chain works by farmers selling their products to dairy processors who process and package the product. Supermarkets then buy the packaged milk from the processors, both private label and branded products, and sell it to consumers. Among other terms of reference set by the Treasurer, the ACCC examined the impact of supermarket pricing of private label milk and other dairy products on outcomes up the dairy supply chain.